Find your new home in Holiday City Berkeley. Learn about the 9 different communities. Holiday City at Berkeley is an Over 55 Active Adult community in Berkeley, Ocean County, NJ. Many people think the homes in the Holiday City area are in Toms River, but they are in Berkeley. Holiday City at Berkeley is actually comprised of many different communities. The communities are listed above. Each of the communities has their own clubhouse and offer many clubs and activities – including trips to Atlantic City and elsewhere. Most communities also have an outdoor pool. Construction started in Holiday City over 40 years ago, and has almost 16,000 houses. The newest homes were built in the 1990’s.The houses are typically 2 bedrooms, with either 1 or 2 baths – most have a 1 or 2 car garage. In fact, there are over 20 different models of homes in Holiday City. The Holiday communities are nicely located because there are numerous doctors and stores in Holiday City. And for many homes, they’re all within walking distance. Additionally, other shopping, such as the Ocean County Mall, are within easy driving distance. And when you need medical care, a major medical center is also near. Private bus service is also available from each of the 9 clubhouses. Lawn service,snow removal and common area maintenance are also included in the low monthly maintenance fees in most of the communities. When you add in low taxes, this makes Holiday City an affordable place to live. 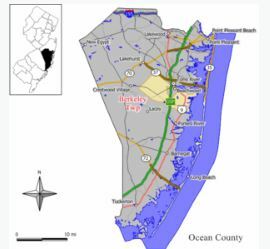 Ocean County provides bus transportation throughout Ocean County. In fact, 12 bus routes connect seniors in key residential areas with popular destinations. Furthermore, the Reserve-A-Ride Program provides door-to-door, non-emergency medical transportation service. This transports seniors (age 60 and over) to medical facilities in Ocean County. You’ll need to make advance reservations however, a fee is charged. When you’re ready to either buy or sell a home in an active adult community in Holiday City Berkeley, contact us. Call Bunny and Art Reiman – the Active Adult Community Specialists.